Prune juice is something of an anomaly. Unlike other kinds of juice, it isn’t made by extracting juice from fresh fruit. Instead, prune juice is made from dried plums that have been pureed and liquefied in hot water. While the highly concentrated beverage has its benefits, it probably won’t encourage weight loss. You’ll get just over 180 calories from a cup of unsweetened prune juice, according to the U.S. Department of Agriculture. This makes prune juice roughly 40 percent higher in calories than the average fruit juice, which supplies about 110 calories per cup. Liquid calories are absorbed more quickly -- and are therefore less satiating -- than those obtained from food. Prune juice is rich in sorbitol, an indigestible sugar alcohol that stimulates the bowels. While small amounts of sorbitol promote regularity, consuming larger quantities has a laxative effect that can lead to loose, watery stools. Laxative-induced diarrhea may help you lose some water weight, but the results are temporary and don’t affect body fat. 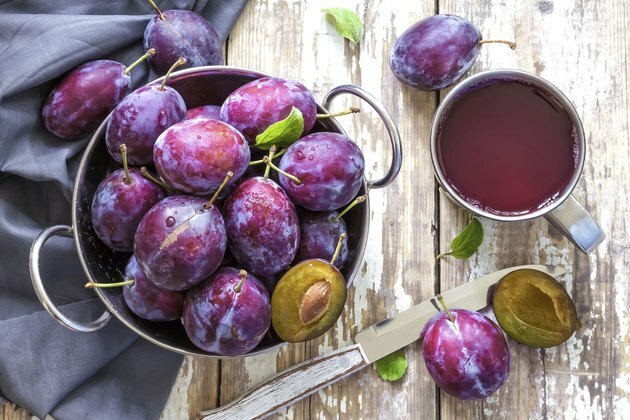 When it comes to weight loss, eating prunes may be more beneficial than drinking prune juice. As a good source of fiber, prunes are a relatively satiating snack that can help stave off hunger and prevent overeating. As with all dried fruit, however, portion control is important -- a 1/4-cup serving of prunes has about 105 calories.